Jose Dávila’s ‘Shadow As Rumour’ at the Max Wigram Gallery, London. Jose Dávila’s initial training as an architect shapes his practice, informed by the histories of art, design and urban space. At the Max Wigram Gallery, he takes photographs of Dan Flavin’s lighting strip sculptures and cuts out the lights themselves leaving empty voids within the photographic print. Sculptural arrangements in space are thus reduced to the flat page and then excised from the image. The viewer sees the ambient light and colour emitted from the original sculptures but their once solid forms are now absent. The space is filled by underlying white paper within the frame. 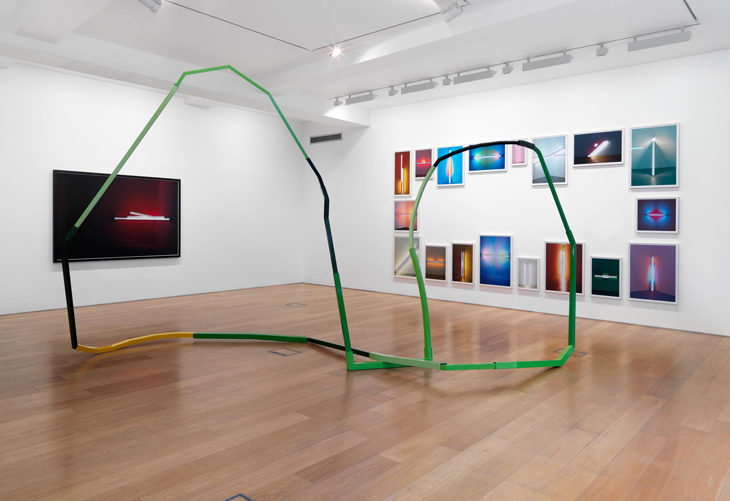 ‘Topologies of Light’, 2013, comprises 18 individual images of different works by Flavin, arranged as a composite piece across the wall. Together, the photographs form a frame around an empty space. The rich, ambient hues of Flavin’s sculptures remain seductive, but Dávila disrupts the logic with his interventions. Where the light strips took physical form, we now look directly at a void more glaring than the original electrical beams. ‘Shadow As Rumour’ departs from altered representations of pre-existing artworks. Now Dávila constructs his own sculpture using a Mobius strip, resembling a figure of 8 placed on its side. We encounter a linear obstruction running diagonally across the room. Instead of geometric and mathematical perfection, this object is rickety and meandering. It twists awkwardly as steel arms slot together forming rough joints. These breaks are articulated in varying colours of green, yellow and black like a syntax. This infinite loop hesitates and stalls as if it were a faltering machine. The prospect of smooth and flowing curves is interrupted and sets up the metaphor of imperfect systems. ‘Shadow As Rumour’ runs as a narrow and even fragile loop hovering between monumentality and doubt. This interrogation of histories is now a familiar enquiry among contemporary artists looking over their shoulder in order to plot a course into the future. There’s a risk here of repeating a wider engagement with the past that begins to feel rather introspective though the adaptation of Flavin’s light works has some audacious flair raising interesting questions around quotation and comprehension. But it’s Dávila’s invented, rambling sculpture that is the star of the show.